Had a thought to watercolor the die cut stem silhouettes with my Kuretake Gansai Tambi watercolors. Followed the lines of the paint chip (Sherwin Williams HGTV line) with two other scraps of paper. Layered over a piece of Heidi Swapp Favorite Things paper. Supplies: Stamp – Cornish Heritage Farms, paper – Heidi Swapp Favorite Things, Lowe’s paint chip, Neenah Classic Crest Solar White, Papertrey Ink Kraft, Stampin’ Up! Daffodil Delight, watercolor paper source unknown, ink – Palette Noir Black, watercolors – Kuretake Gansai Tambi, dies – Taylored Expressions. Categories: card | Tags: card, Cornish Heritage Farms, Heidi Swapp, Kuretake, Neenah, Stampin' Up!, Taylored Expressions | Permalink. Paints chip? What a great idea! 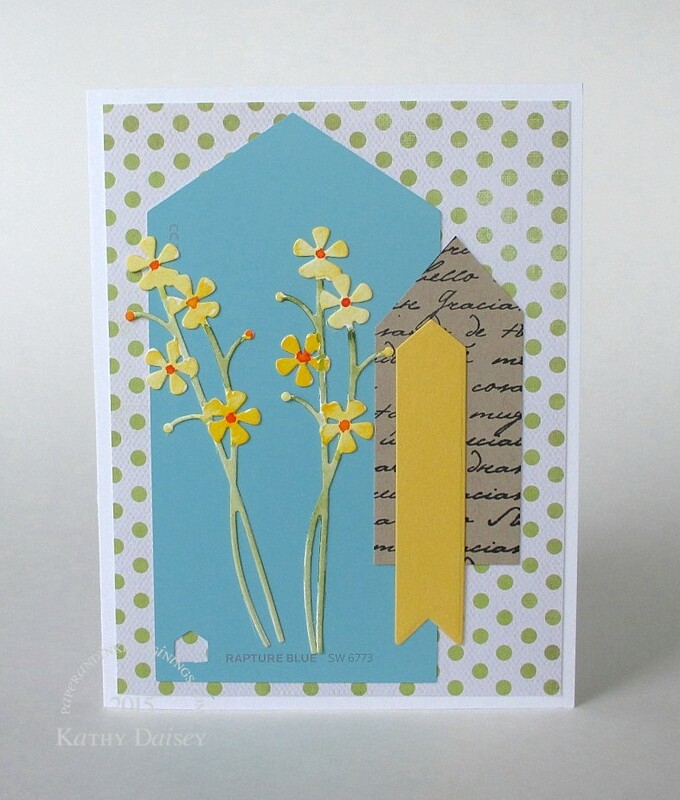 This is such a pretty card Kathy! Oh, thanks so much, Holly! I use my fair share of paint chips (did not come up with the original idea, can’t remember who on Splitcoaststampers thought to do it way back when…). anytime, anytime! 😉 I do so enjoy our interaction!